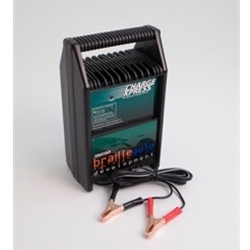 10 Amp Rapid Charger 12 Volt Charger 10 Amp Hour Variable Electronic Control Alligator Clamp Connections 10 Amp Rapid Charger - Features 1 Faster Charging This 10 amp hour charger is the fastest way to get your Braille battery back to full charge. Note: Due to the fast charging rate this model is not recommended for our smallest batteries. Check the individual batteries "options" for compatability. 3 Reverse Polarity Protection All of us have those moments when under pressure we hook something up backwards. To protect against those situations, this charger has a special design to prevent the charger from turning on if the battery is not connected properly. To provide voltage this charger will search for correct polatiry voltage. 5 Quick Connects Designed to work with any type of 12 volt connection, these "alligator clips" provide and easy way to clamp this charger to your battery that needs a boost. These quick connects are of a very high quality design to provide years of service. 2 No Babysitting If you hate wasting time watching a charger so your battery does not overcharge? Braille's electronic battery charger line is perfect for you. We feel that a charger should be smart enough to get your battery ready to use without you having to "babysit" to make sure it doesn't overcharge. 4 Durable ABS Design Designed for a long life under "race" conditions, this durable casing helps provide a sturdy platform to house the advanced electronics. The easy grab handle allows quick movement in a hurry. 6 Simple Charge Indicator The exclusive VCLED "variable-colored light emiting diode" provides simple quick reference as to the state of charge of the battery and the function of the charger. With electronics programmed for our Advanced AGM batteries this charger provides just the information you need.